Imagine being in a room with almost 100 other students. You’re sweating profusely. You’re shaking convulsively. You’re breathing heavily. You’re about to stand up and admit something that has haunted you your entire life, something that may instantly cast you out. 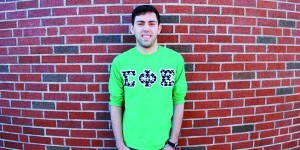 Michael Castro’s courage inspired other men in his fraternity to come out. If you look at Castro, a friendly face and a welcoming smile await you. Beneath his fraternity letters, dark, faded jeans and normal build, Castro blends right in with the Quinnipiac crowd. Growing up yielded similar results. Up until his junior year at Quinnipiac, Castro covered up his sexuality and often battled against it. Through dating girls and joining his friends in unintentionally hurtful name calling, feeling trapped and abnormal was a common emotion. It wasn’t until last year that Castro felt he was ready to tell the truth. Starting with a close friend, Castro almost instantly felt relief. After much deliberation with the few friends he trusted, Castro decided he was ready to tell his fraternity brothers. After Castro told the filled room of Sig Ep brothers of his sexual nature, the room erupted with claps of assurance. In response to Castro’s act of courage, something unexpected happened: two more members came forth and admitted their true sexuality. Coming out to his mother proved not as easy. Raised Catholic throughout his life, his family had a differing set of morals. Castro said he remembered having a gay neighbor, and although his parents were fine with it, they viewed it as unnatural and abnormal. After a dinner out with his mother in Hamden during the beginning of his junior year, Castro broke the news. She was not as receptive. “Half of gay males experience a negative parental reaction when they come out and in 26 percent of those cases the youth was thrown out of the home,” according to the Parents, Families, and Friends of Lesbians and Gays Organization. Castro initially expected his mother to be the most accepting, but his father, a devout Catholic, proved to be more understanding from the start. According to the Williams Institute at the UCLA School of Law, more than 9 million Americans identified themselves as Lesbian, Gay, Bisexual or Transgender in 2011. Homosexuality, although more prevalent now than ever before in America, has had a rough path in the past century. Castro cites a generation gap as the reason behind the disconnect. Today, Castro’s parents are more supportive than ever, and his mother is open to anyone in his life. It would be the support of his family and friends that would propel Castro to be an active and productive member at Quinnipiac. Among other accomplishments, Castro became the Phi Sigma Sigma sweetheart : an honor given only to few before him. As for his future, graduate school for a degree in public health is on the horizon. But Castro will no longer hide his true self.